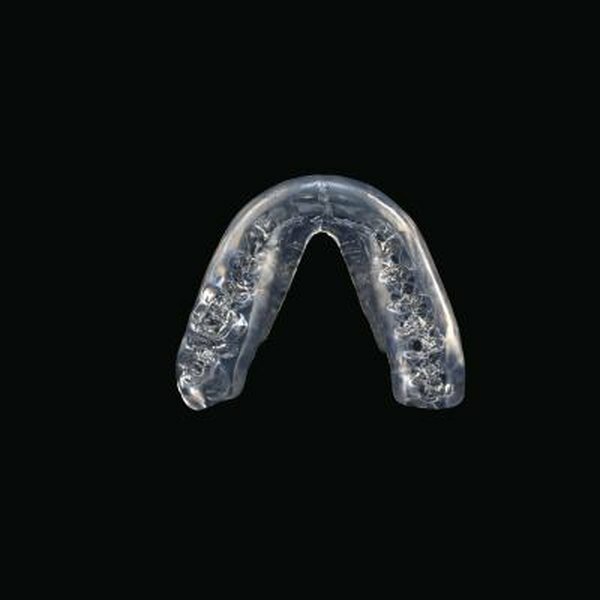 Mouth guards help protect your teeth and gums from nighttime teeth grinding and contact sports. Premade mouth guards available at sporting goods stores are inexpensive, but since they do not adjust to your teeth they do not provide as much protection as a custom mouth tray. Premade mouth trays and guards can also make it difficult to breathe and talk. Making your own custom mouth guard is easy to do with a boil and bite kit. Fill a pot with water 2 to 3 inches deep and place it on a stove burner set to high until it reaches a rolling boil. Fill a bowl with lukewarm water and place it off to the side. Place the mouth guard in the boiling water and allow it to heat up for about one minute, or for the length of time recommended on the package. Use a pair of cooking tongs to remove the mouth guard from the boiling water and dip it into the bowl of lukewarm water for about five seconds. Place the mouth guard over your teeth immediately after removing it from the bowl and clench your teeth around the plastic. Hold your jaw tightly around the mouth guard for about one minute so the heated plastic can form to your teeth. Remove the mouth guard and place it in a clean storage container or on a clean paper towel so that it can harden fully. This process can take one to two hours ,depending on the specific mouth guard. Always rinse your mouth guard before placing it in your mouth, and clean it with a toothbrush and toothpaste after wearing it. Store your mouth guard in a plastic box with perforation holes.